The Janome CoverPro 900CPX is a coverstitch sewing machine which includes a wide range of features that are perfect for the at-home sewer. The free arm capability and an extra wide flat bed provides a lot of space to easily accommodate any sized project. On thing this machine is known for is Its exclusive Seam Tightening System (STS). The STS helps reduce the amount of slack that is typical in looper threads to give the user sturdier, tighter, and more flat stitches. People often ask about the difference between the 900CPX and the Janome Coverpro 1000CPX. The Janome 900 has two needles where the latter is capable of stitching with three needles using four thread spools as well as sew two different kinds of stitch widths: 3mm (narrow) or a 6mm (wide). The 900CPX has only one stitch width option which is 5mm (wide). The Janome 1000CPX is a much more powerful machine, but it is also considerably more expensive. I hope to review that one at a later date. Both the Janome 900 and 1000 CPX models are capable of chain stitching either a utility or decorative stitch using a single needle. However, coverstitch sewing machines are mostly used to give sewing projects a professional finish, like sewing a professional hem on a pair of pants. Let’s get to the features of the Janome 900 CPX. One of the nice things about the 900CPX is that it has a chart for quick reference posted on the front panel of the machine to make it more convenient to select your desired stitch. It ts here where you will also find all of the machine’s settings and options. They are clearly labelled so there is no need to go through the instructional manual. The Janome 900CPX has the distinction of being as useful as it is powerful. This machine is the result of innovative design that was based on an industrial-strength cover hem and a home use sewing machine. It may look like a regular sewing machine but its performance is that of a heavy duty cover hem workhorse that comes equipped with a long sewing arm and can achieve an impressively high stitch speed. 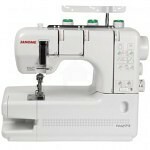 This Janome CoverPro Coverstitch Machine has the largest work space when compared to other sewing machines in its class measuring four inches by 5.5 inches. It has the capacity to sew a thousand stitches/minute with the ability to change the length of your stitch between one and five millimeters and also a variable differential feed ratio between 0.5 and 2.25. This Janome Cover Pro has a vertical drop needle, an exclusive configuration for its free arm, and is operable with either hand because its presser foot has a lifter that is strategically located behind its needle. The differential feed and stitch length dials are conveniently located on its belt cover to be easily accessible to the user. Narrow elastic gathering for use as attachment. Wide elastic gathering for use as attachment. Extension table measuring 8” x 11½” made of resin. Hemming guides in Type I and Type II. Wide elastic gathering for use as attachment with the elastic’s application to the fabric’s underside. Box of six EL x 705 sized 90/14 needles. Extension table measuring 18” x 24” made of acrylic. Extremely useful and performs excellently for specialty stitches. Suitable for use on woven fabrics. Less expensive than the 1000CPX. Makes garments look professionally-sewn because of the clean, sleek finish usually found only on high-end sergers. Ideal for stretch fabrics such as knits. The downside of extremely fast sewing capability is that this Janome model has only two kinds of stitches that can be used (cover hem and straight stitches). I couldn’t be happier with the Janome 900. If you make a lot of clothing, especially if you are a professional tailor, you will be thrilled with the results of this machine. Stitches are beautiful, straight and consistent. One thing I do recommend is that you also purchase the Janome Clear Coverstitch Foot. This will allow you to watch you stitches as you work to make sure you are getting the best results. Threading can be a little intimidating at first, but it really isn’t that hard. Once you’ve done it a few times you won’t even think about it. One thing that I found useful were the many videos you can find on YouTube. They cover many aspects of this machine and can be super helpful to get you up and running or to help you out with features of the machine you are unsure about. I highly recommend you to view them if you do end up getting this Janome sewing machine. Also, if you want to check out more Janome sewing machine reviews then go here. The Janome CoverPro 900CPX Cover Hem Machine is recommended to seamstresses who want fast sewing with precision and industrial-grade results. This model is not for the faint of heart or those who desire sewing machines with other options such as embroidery appliquéing or quilting (www.grandmalikestosew.com/best-quilting-sewing-machine). If however you do need a coverstitch machine you will be very happy with the Janome 900. It does everything you expect and does it well. Is it possible to hem denim jeans with this machine? Thank you. You can definitely hem jeans with this machine. I am sewing cashmere knits using recycled sweaters. Would the Janome 900CP or the 1000CP be best? Hello Kay, both are good machines, but if you can afford it I would go with the Janome 1000CP.